If you are weary or needing comfort, cling to the Lord...picture him holding you in His arms. Only Those Who Come to Jesus"
"I Believe Jesus Died For Me"
"When I see Jesus Coming"
"Jesus Takes My Burdens Away"
"Wilt Thou Be Made Whole"
"Only Believe" "If You Don't Have A Dream"
This world has pleasures for a season to hold. But I've got something that this world can't give. I've got the Lord and He's enough. I've got the Lord when things get rough. I know that He is watching over me. I've got the Lord, He's all I need. And life's worth living for when you've got the Lord. To make you feel number one. This world can give you religion for the lost. But this world just can't give you what I found in the cross. 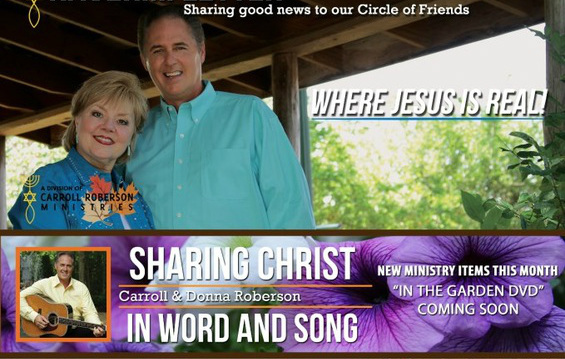 the Lord has called Carroll Roberson to minister to people all over the world. for him to share Jesus Christ in word and song. Roberson was born July 17, 1955 in Ripley, Mississippi. He read the Bible growing up but did not surrender his life to Christ until 1983. One year later, he was diagnosed with a cancerous growth on his throat. Roberson underwent thyroid surgery and was able to sing again within three weeks. Shortly after, Roberson surrendered to full-time ministry. and went into full-time evangelism with his office stationed in his home town of Ripley, Mississippi. 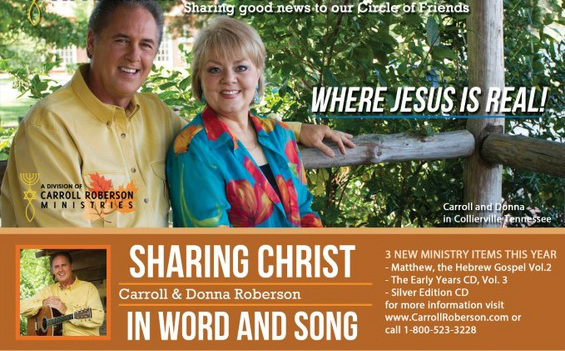 Through revivals, crusades, and concerts, Roberson keeps a two-year schedule around the country. Roberson is well known for his singing and has written over 300 songs and recorded over 40 albums. He has had national success with songs like "Wilt Thou Be Made Whole", which stayed at #1 on the Singing News charts in 1995 for two months, as well as 15 top-ten songs throughout the late 1990s. Roberson has had over 50 songs in the gospel music charts since 1988.
including the Top Soloist award from VoiceMagazine and Hearts Aflame Soloist of the year in 1998.
which is seen in millions of homes all over the world on The Church Channel. accompanied by his wife, Donna, and is filmed across the country with an outdoor setting. Roberson has been hosting tours to Israel since 1993. He has also filmed several teaching DVDs in Israel. Visiting the home of the Hebrews is something Roberson believes is very useful, and he regularly researches the scriptures from the Hebraic perspective. Much of his time is devoted to Jewish studies on Jesus as the Messiah. He is working on an in-depth commentary on the gospel of Matthew.